…getting everyone online is not only important for individuals who may be left out of the digital economy, but also for society as a whole that benefits from having everyone connected and contributing online. …“making everyone an Internet consumer” is not sufficient to ensure full participation in the digital economy. The recommendations related to promoting inclusion and opportunities started from the premise that getting everyone online is not only important for individuals who may be left out of the digital economy, but also for society as a whole that benefits from having everyone connected and contributing online. In fact, Metcalfe’s Law asserts that the value of a telecommunications network is equal to the square of the total number of users of that network, which suggests that investing in increasing online participation will pay a dividend to society as a whole and to everyone who is online. The good news is that the U.S. has made steady progress toward digital inclusion. Between 2000 and 2016, according to the Pew Research Center, the percentage of Americans who do not use the Internet fell more than 70 percent, from nearly half of all U.S. adults to just 13 percent. Just from 2010, when the National Broadband Plan was published, the number of those offline fell by nearly half, from 24 percent to 13 percent. And a great majority of American households are now linked to the Internet via fast broadband connections. In little more than a decade from 2000 to 2013, the percentage of American adults with access to home broadband grew from just one percent to 70 percent. However, data from the last few years suggests that this growth may have plateaued as some decide to forego traditional fixed broadband service for purely wireless service to either a smartphone or other connected devices. As these data show, the so-called digital divide has diminished over time, but it has not disappeared completely. While no one expects that broadband connectivity will ever reach 100 percent of households, other media have come close: In recent years, penetration of television and telephones (both wired and wireless) reached approximately 96 percent of households. Anatomy of the Digital Divide: Reasons for Non-Adoption. In order to understand the nature of the remaining gap, it is useful to look at the reasons that those who do not use the Internet at home give for not making use of it. A recent report from the NTIA’s Office of Policy Analysis and Development presented data from a 2015 survey on “who’s not online and why.” The report looked at the reasons given by both individuals who had never had Internet service at home and those who had it at some point in the past but do not currently have it. While lack of access to Internet service was originally a major reason for non-use, today only a few percent of those without home access to the Internet in 2015 cited lack of availability in their area as the reason for their non-adoption. However, there are some places in the country where lack of access—and particularly lack of broadband access—to the Internet is still an issue. Another reason for deciding not to become a broadband user is affordability. The NTIA study found that one-fifth of those who had never had home Internet access cited cost as their primary reason for non-use, as did just over 30 percent of those who had access at some time in the past but did not currently have it. But the most important factor in non-adoption in recent years is the perceived relevance of the online content. 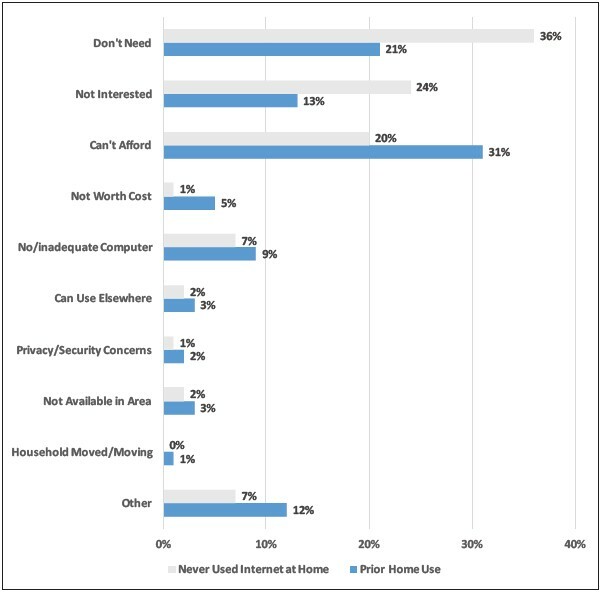 More than half (60 percent) of people who have not had home access cited either lack of a perceived need or of a perceived interest in online content as their main reason for non-use. While a smaller portion of those who had previously had home access cited lack of need or interest (40 percent), the two factors combined still were more important than cost. 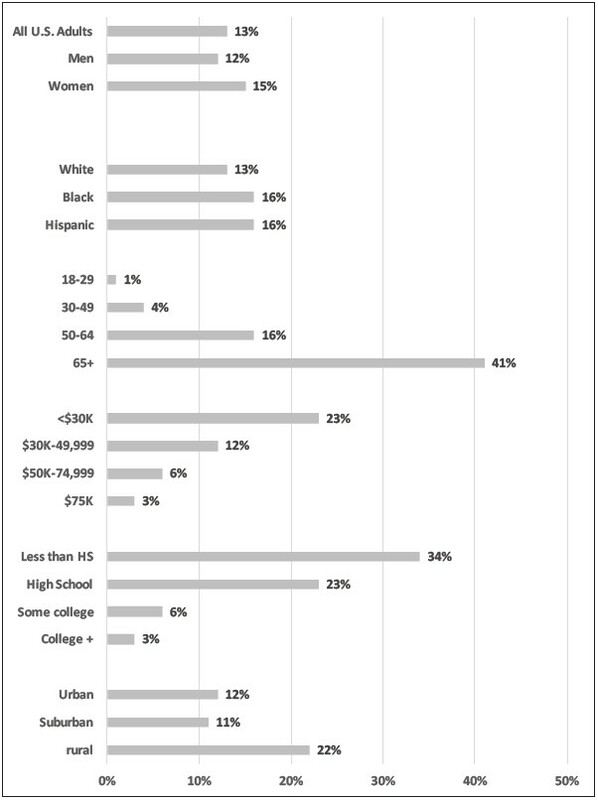 Demographics of Non-Adopters. It is also useful to look at who, demographically, tends to be non-adopters. According to a 2016 report from the Pew Research Center, just 13 percent of adult Americans do not currently use the Internet at all. This figure is well below the 48 percent of American adults who did not use the Internet in 2000, but it has stayed steady for the past several years. Rural—22 percent of rural residents are offline compared to 12 percent of urban dwellers. While the use of the Internet has grown steadily among all of these groups, the gap between different demographic groups has persisted for many years. For example, while Internet use among those over age 65 has increased from 14 percent in 2000 to 58 percent in 2015, the gap in usage between seniors and younger people has remained, and the same is true for income and educational levels and for urban/rural residents. The geography of non-adoption. According to FCC Commissioner Mignon Clyburn, there are 353 counties in the U.S. that are identified as being marked by “persistent poverty”—that is, counties in which 20 percent or more of the population have lived in poverty over the last 30 years. The large majority (301counties or 85 percent) of these persistent-poverty counties are non-metro, and they represent 15 percent of all non-metro counties. Persistent poverty also demonstrates a regional pattern, with nearly 84 percent of persistent-poverty counties in the South, comprising more than 20 percent of all counties in the region. Demographically, these counties have populations that tend to be poorer, less well educated and older than the U.S. population as a whole, and therefore tend to have lower rates of broadband adoption and use. Given the different reasons that non-adopters have for not being online, the Aspen conference recommended three types of actions to overcome the remaining digital divide. The first is intended to expand access in places that still lack access. The second focuses on the problem of affordability and included several specific recommendations to increase the effectiveness of the federal Lifeline program, and also to encourage greater state-level innovation in this area. The third set of actions is intended to spur adoption and use of broadband, particularly among those who do not see the Internet as relevant to their needs, by expanding and improving the online availability of government services of particular interest to current non-adopters. The magnitude of the divide depends on the definition of broadband service, with a larger gap existing with higher speed broadband as the criterion. But even when broadband is defined as 4Mbps/1 Mbps, a gap still exists between urban and rural areas: while 95% of the total U.S. population has access to broadband service under this definition, just 81% of rural residents do. To help the country’s rural areas to close the digital divide, the FCC provides funds to bring broadband to areas that current lack access to it. In 2014, the FCC created the Connect America Fund (CAF) by modifying its existing High Cost Fund to focus more directly on expanding broadband access. It provides up to $20 billion over a five year period to subsidize the cost of broadband in rural areas where it is not available or is available only at low speeds. An auction mechanism awards CAF funds to bidders that offer to provide service at the lowest level of support. 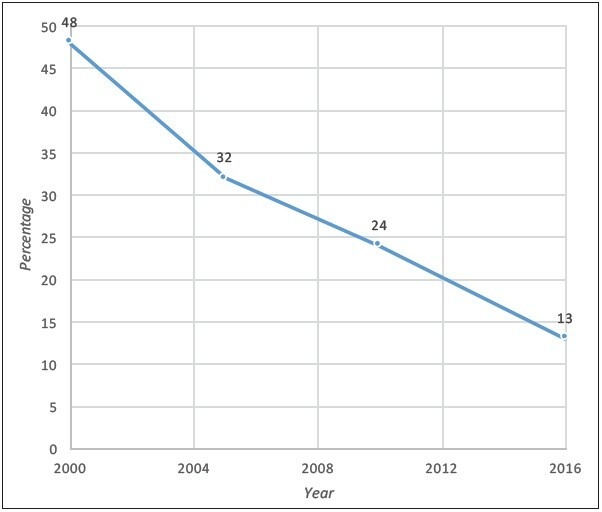 The article notes that 81 of Kansas’s 105 counties have lost population since 2000, with the ten counties with the steepest declines averaging losses of 20 percent, and concludes that “the trend is expected to worsen if Internet service to rural areas isn’t improved.” The article takes note of the Connect America Fund which is intended to subsidize rural broadband service, but quotes critics who fault the program for being too complex and involving too much red tape, which represent barriers to participation in the program, particularly for small, rural telephone companies. 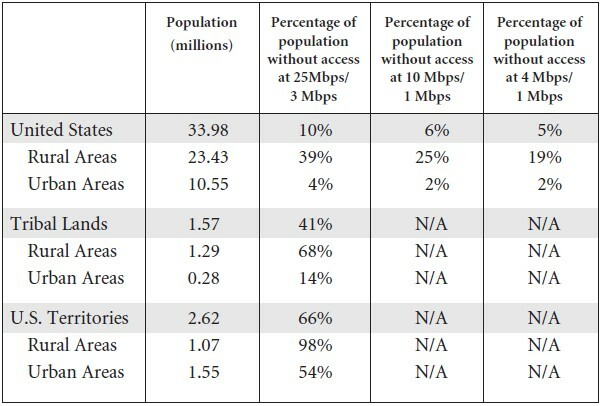 Even though the amount of money provided annually by the Connect America Fund (CAF) to improve rural broadband is substantial, it is probably not sufficient to fully close the connectivity gap between urban and rural areas. And deploying the next generation of broadband networks, including fiber optics for fixed access and 5G technology for wireless broadband, will require a massive amount of capital. Since investors will focus first on areas where demand is greatest—typically urban areas with the densest concentration of people and business enterprises—it is possible that the gap between urban and rural America will widen further rather than narrowing as new technologies continue to be introduced. Infrastructure Bank. To address the problem of inadequate investment in rural broadband, some of the Aspen conference participants proposed that the next administration create a “21st Century Infrastructure Bank.” This bank could leverage funds that currently go into the Universal Service Fund (USF) to raise a much larger amount of capital that could be directed toward accelerating and expanding deployment of next-generation communications infrastructure that would serve all Americans. Under this proposal, the Infrastructure Bank would issue bonds that would be funded by current USF receipts and could be guaranteed by the Federal Reserve to ensure that the bonds would carry the lowest possible interest rate. The money raised from these bonds would be distributed by an auction mechanism similar to that currently used for the CAF and would award funds to market participants who offered to provide the most pervasive infrastructure deployment at the lowest cost. The companies that received these funds would own the infrastructure they build and would be responsible for ongoing operating and maintenance expenses. In return, they would be required to offer service to customers in perpetuity at a regulated wholesale rate. In order to win the funds, participating companies would have an incentive to contribute their own capital to deployment, which would have a multiplier effect for total capital investment. Assuming that the $4.5 billion annually allocated for the Connect America Fund is used, this amount could raise approximately $89 billion for 30-year bonds that would carry a 3 percent interest rate. If the bonds carried an interest rate of 1 percent, the amount that could be raised would grow to $117 billion. An alternative source of funds would be a tax on the repatriation of cash held abroad by U.S. corporations—an issue that was raised during the 2016 presidential campaign. With an estimated $2.1 trillion in foreign earnings being held overseas, a one-time offer to repatriate this money with a tax rate of 10 percent would raise $210 billion that could also be used to fund a 21st Century Infrastructure Bank. Several participants raised legal and policy concerns about the proposal, notably the extent to which the fund would subsidize a single company’s broadband deployment in areas that might be served by commercial providers without government subsidy. Potential unintended consequences could therefore include providing support for a monopoly service model, reducing private sector investment, chilling innovation and reducing jobs. Noting that Lifeline programs tend to carry a certain amount of stigma from the need to rely on a subsidized service and are often not effectively promoted, the Aspen conference participants called for improved marketing efforts that would de-stigmatize and normalize participating in these programs by making them more attractive, perhaps by using similar techniques to those that companies use to promote their commercial offerings. Since Lifeline programs are offered on a state-by-state basis, greater innovation and experimentation at the state level in how these programs are packaged and marketed should be encouraged. Increasing Adoption. Today, the biggest obstacle to getting everyone online is neither lack of availability nor affordability of broadband, but rather a lack of interest. Some people feel that they simply do not want or do not need to be online. According to the 2015 NTIA survey, more than half of all non-adopters cited this as their main reason for not being online. As noted previously, non-adopters tend to skew toward being older, poorer and less well educated—all groups that tend to be make use of multiple government services. Therefore, one way to encourage usage by non-adopters would be to make sure that government services that are relevant to these groups are online and easy to access and use. For older Americans, [high-value applications] include one-stop shopping for information about Social Security, Medicare and tailored services, such as telehealth. For rural users, as well as those with less education, key services are those that help with both education and employment: matching résumés with openings, signing up for vocational education for in-demand positions and financial aid. Health insurance and child welfare services are also critical. It is true that the government has not been particularly adept at creating online applications that are appealing and easy to use, with the problems encountered with the launch of healthcare.gov perhaps the most egregious example. But the government seems to be making a conscious effort to make its services more available online and to develop effective, user-friendly applications. For example, data.gov was established in 2009 to make valuable government-created information more available. Starting with 47 datasets, the site now provides access to more than 190,000 datasets. In 2014, in the wake of the problems encountered in the development of healthcare.gov, the General Services Administration created 18F, a small group within GSA that uses lean start up methods and open source software to build digital applications for government agencies. Also in 2014, the White House launched the U.S. Digital Service as a “start-up to pair the country’s top technology talent with the best public servants to improve the usefulness and reliability of the country’s most important digital services.” Initiatives like these, which bring skilled people and resources from the private sector into government, could be helpful in developing apps that address the needs of non-adopters. To support these kinds of efforts, it would also be useful to review and reform procurement rules that make it difficult for government to recruit first class talent, and too often act as a straightjacket that stifles innovation. To further stimulate innovation, government agencies could use the operational savings generated by putting services online to establish venture funds that could invest in development of useful new applications. Finally, to raise awareness of the potential of new communications technologies for local communities and the value of putting government services online at all levels, it would be useful to create a “PCAST for Mayors,” modeled after the President’s Council of Advisors on Science and Technology (originally created by President George H.W. Bush and continued by each subsequent president). This new council could bring together leading scientists and engineers to make recommendations on a wide range of issues related to science and technology. A similar resource would provide expert advice on technology to local leaders. Such a body could be sponsored by the National League of Cities or the U.S. Conference of Mayors, which focuses on larger cities. Beyond promoting greater access, affordability and adoption of new telecom services in order to close the digital divide, there are actions that the government can take to encourage wider use of these networks, among not only “disadvantaged” groups but those that stand to benefit greatly from the use of new telecom-based technologies. The National Broadband Plan (NBP), mandated by Congress and released by the Federal Communications Commission in 2010, made an important contribution to raising awareness of the importance of broadband and provided a “roadmap” for extending high performance Internet access to all Americans. Former FCC Chairman Reed Hundt commented that the Plan was “an exemplary blueprint” that was based on extensive outreach and coalition building to develop a consensus around its recommendations. Hundt also pointed out that the plan is relatively unique in articulating a broad vision that identified an important national priority, and providing specific recommendations for actions to realize that vision. Unfortunately, an unexpected development occurred just two weeks after the Plan was released—a court decision was announced that invalidated the FCC’s net neutrality rules and calling into question the Commission’s authority to regulate broadband. According to Blair Levin, who was the lead author of the NBP, dealing with this setback became a major preoccupation for the Commission that sharply reduced attention given to the NBP. As Rob Atkinson, Founder and President of the Information Technology and Innovation Foundation, noted, the Plan did not just discuss the technology but also explored the larger ecosystem that broadband supports. The final section of the Plan, “National Purpose,” describes the potential of broadband to improve performance in, even to transform, seven key sectors of the society [Health care, Education, Energy and the Environment, Economic Opportunity, Government Performance, Civic Engagement, and Public Safety]. It also proposes strategies for encouraging faster adoption of the technology in each of them. The Aspen conference recommended that a new administration sponsor a “quick update” of the National Broadband Plan, and particularly of these “National Purpose” sections to reflect how technology has evolved since 2010. For example, gigabit-speed broadband is now available in a number of communities; self-driving vehicles are beginning to operate on the street; the Internet of Things has begun to take shape; and there is greater awareness today of 5G, the next generation wireless standard. The update could reconsider the impact that these evolving capabilities will have on key aspects of our society and our economy. For example, a discussion of healthcare would provide an opportunity to highlight the rapidly growing usefulness of telemedicine and remote patient monitoring, while the section on energy and the environment would be a way to explore the potential for a smart electrical grid and the value of distributed generation. The section on economic opportunity could address the impact on the future of work and employment of rapidly evolving technologies like artificial intelligence, robotics and matching platforms like Uber. Once an update of the Plan is completed, the results could be “taken on the road” through a series of regional meetings that would highlight the potential of broadband to stimulate innovation and growth. The goal would be to inspire broader engagement in preparing for a digital future that is already arriving and that has real consequences for many sectors of society. One powerful message that an updated plan could deliver is that communities that most rapidly deploy a high-performance broadband infrastructure will have a competitive advantage in attracting businesses and perhaps even individuals who want to live and work in high-connectivity environments. Such a message could stimulate local competitions that would accelerate the development and deployment of a broadband infrastructure. A question that participants debated but did not resolve was where this update should be based. On the one hand, the FCC was the place where the original NBP was created and would therefore be a logical place to host an update. On the other hand, having the White House take responsibility for the update would potentially give it more prestige and greater visibility. It would also be an appropriate place for dealing with cross-cutting issues that go beyond the purview of the FCC. The downside of White House sponsorship would be the possibility that the effort could get insufficient attention and resources as a result of multiple competing priorities. Another plausible home for the update would be the Broadband Opportunity Council, which includes representatives from 25 federal agencies and departments and is chaired by the Departments of Commerce and Agriculture. The Council was established by President Obama in 2015 with a mandate to identify ways to better support communities seeking investments in broadband and to recommend actions to remove barriers to broadband deployment and use. As FCC Chairman Wheeler noted, both the NBP and the Broadband Opportunity Council have a shared goal of raising public awareness of the importance of broadband. Yet another alternative would be to house an update at the National Telecommunications and Information Agency (NTIA), the agency that is principally responsible for advising the President on telecommunications and information policy issues. But wherever this effort is housed, Congress, which might be called on to appropriate funds for the update, should be enlisted to support the effort. While there are important benefits to getting all Americans online, just “making everyone an Internet consumer” is not sufficient to ensure full participation in the digital economy. A final set of recommendations related to inclusion focused on policies to expand economic participation in the telecommunications industry, especially for disadvantaged groups who have historically been excluded from such opportunities. Fortunately, new tools are available to help accomplish this goal. For example, the SEC, at the direction of Congress, introduced new rules in 2015 that permit equity-based crowdfunding of entrepreneurial ventures by exempting smaller ventures from many of the rules that govern stock offerings.iii But more needs to be done to widen access to deal flows for small businesses and individuals. Creating mechanisms to bring in new investments could be a win-win opportunity. At the same time that such a strategy would expand participation, benefitting groups previously excluded from the marketplace, it would also provide new capital to fund telecom infrastructure in places where it might not otherwise be deployed (including locations that have not been a priority for major providers to pursue). To accomplish this goal, the Aspen conference recommended a combination of carrots and sticks. The biggest stick that the FCC has to promote the full deployment of wireless facilities for which it has granted licenses is its build-out requirements.iv The Commission has not been very strict in enforcing this provision to date, however. If it were to begin to do so, it could encourage greater use of spectrum that is currently underused in places like rural or tribal areas. And stricter enforcement could be coupled with a “carrot” that would provide incentives for holders of unused spectrum to make a deal with a small business such as a recognized Disadvantaged Business Enterprise (DBE) that would take responsibility for building it out in underserved locations. To encourage spectrum holders to make such deals, they could be given a bidding credit for future spectrum auctions, a tax credit, or a tax deferral. i Comcast’s Internet Essentials program offers 10 Mbps Internet access for $9.95 per month with no installation fee, no credit check and no long-term contract, as well as the ability to buy a low-cost computer and get training, to families with children who qualify for the National School Lunch Program. The program has reached more than three million Americans since it was launched in 2011, and Comcast recently announced that eligibility to participate would be expanded to all residents of HUD-assisted housing in areas served by Comcast. In October, 2016, Sprint announced the launch of its One Million Project that will give up to one million low-income high school students a free smartphone, tablet or laptop and a free high-speed data plan until they graduate from high school. Cecile Kang, “Tech Companies Expect Free High-Speed Internet for Poorer Americans to Pay Off Later,” The New York Times, October 11, 2016. Available online: www.nytimes.com/2016/10/12/technology/free-broadband-initiatives-for-poor-and-rural-areas-with-eye-on-future.html. ii An example of a program that has been designed specifically to help seniors learn to use computers and other new technologies is OATS, Older Adult Technology Services, which operates computer learning centers in multiple locations in New York as well as Senior Planet, “a tech themed senior center” in Manhattan. See www.seniorplanet.org. In California, Avenidas, the senior center in Palo Alto, recently launched the Generations Lab with a similar mission. See www.avenidas.org/services/generations-lab. iii The SEC rules permit individuals to invest in securities-based crowdfunding transactions subject to certain investment limits. The rules also limit the amount of money an issuer can raise using the crowdfunding exemption, impose disclosure requirements on issuers, and create a regulatory framework for the broker-dealers and funding portals that facilitate the crowdfunding transactions. See SEC Adopts Rules to Permit Crowdfunding, U.S. Securities and Exchange Commission. Available online: https://www.sec.gov/news/pressrelease/2015-249.html. iv “If a licensee fails to construct a frequency, fails to construct a location, fails to construct an entire license, or fails to meet a coverage requirement, the frequency, location, or license terminates automatically as of the applicable construction/coverage deadline.” Construction/Coverage Requirements, FCC Wireless Bureau. Available online: http://wireless.fcc.gov/licensing/index.htm?job=const_req_home.